Sagittarius Traits - The most independent of the zodiac. Sagittarius traits - This sign likes to explore and experience constant movement. There is often a love of the out doors and an urge to take many journeys. Here is a quick visual guide to Sagittarius Traits. Click here to order your Personal Astro Talk Horoscope Report now. The passion to explore extends to both physical and mental realms. It is best for you to concentrate on single minded aims and realize this as part of your life pattern. Your innate desire to exercise your mind and/or body through the study and experience of a vast number of subjects has to be reckoned with for you to achieve your goals. In essence Sagittarius represents a search for self. A constant evolution and personal growth. You work best when both body and mind have equal freedom for development. The	glyph for Sagittarius the Centaur with Bow and Arrow. 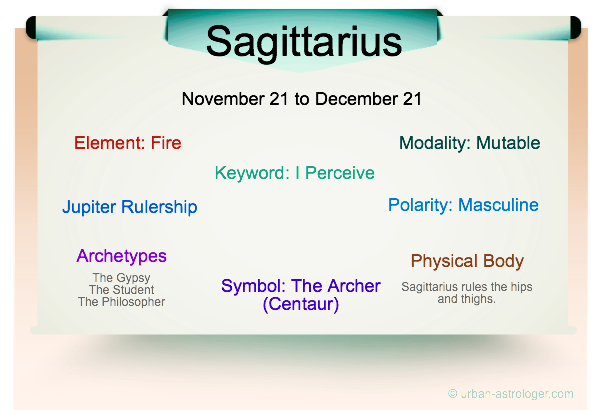 Sagittarius	is the ninth sign of the zodiac, mutable sign and of the fire element. The planet ruler is Jupiter. The Sun enters the sign of Sagittarius around 21 November to 21 December. Symbolically the written symbol of Sagittarius is a weapon - the arrow. People born under this sign are independent, broadminded, and outspoken but diplomatic. It makes you want to leap out of bed in the morning. It satisifies you to the depths of your soul. It's out there waiting for you. Opportunities can help you find it. Want to get a better understanding of the influences of a location on your work and/or business. 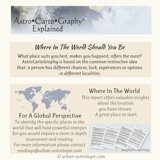 This AstroCartoGraphy Report can help you achieve your goals.